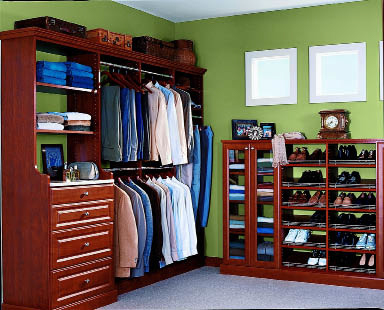 This ORG EcoElements closet is made of 100% recycled material and no added formaldehyde. Available through Alaska Premier Closets. Broan kicks off its 'Ecoforward' initiative with Enery Star-qualified range hoods that offer a total savings of 564 kilowatt hours over comparable standard models. 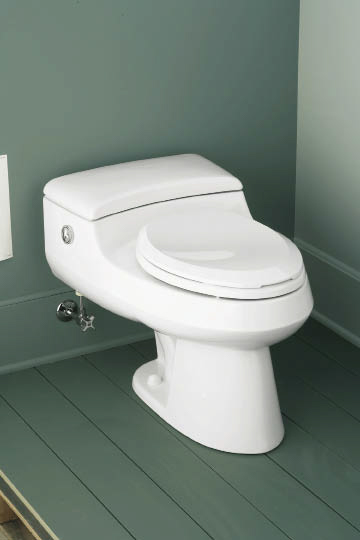 Kohler San Raphael Power Lite Toilet uses at least 20 percent less water than standard 1.6 gallon toilets. For backsplashes, showers and other areas, consider using recycled tile products made from glass or other materials. 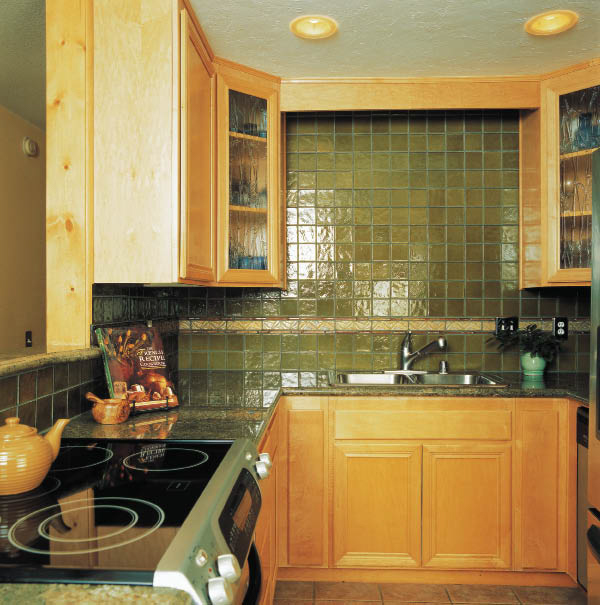 Pictured here: Recycled glass tile from Oceanside Glasstile. Forbo Flooring's new Marmoleum Click is produced of natural linoleum with a cork layer backing for an ecologically and acoustically sound solution. Available through Florcraft, MacCheyne's Carpets Plus and other local retailers. Many home remodels waste large quantities of materials, use inefficient products and do little to enhance the health of the occupants. But home remodels don't have to be that way. If you're looking to create a healthier, more comfortable home while saving money and enhancing the environment, think "green remodeling." As you plan your next remodeling project, here are some tips from the pros. First things first. Consider recycling any materials that you are removing from your home; otherwise, they may all end up in the dump, notes Stacey Dean of Grayling Construction. Some items can be resold, she adds. For example, Habitat for Humanity's ReStore accepts new and used appliances, cabinets, light fixtures, windows and more. "Anybody that comes here is winning," says Colin Hogan, manager of the ReStore in Anchorage. The ReStore sells the donated items at reduced rates and uses the income to help build more homes for low-income families. "We are always in need of six-panel doors, vinyl windows and flooring," he says. "Flooring is a big request." Since opening in 2004, the ReStore has kept more than 3 million pounds of product out of the landfill, Hogan says proudly. The ReStore travels to Eagle River every Wednesday to pick up donations. Habitat for Humanity in Fairbanks is currently working to get their ReStore up and running. For Alaskans who want to responsibly ditch used building materials in other areas, transport companies Carlile and Lynden have been known to help out as long as it's a sizable donation, says Hogan. For information, visit www.hfhanchorage.org/restore. For other opportunities for materials reuse and recycling in your area, check www.recyclingcenters.org; www.1800gotjunk.com. Wood vs. steel? Both come at a cost, says David Doolen of JADA Construction. "You're cutting down trees to get a stud, but you're putting smoke in the air to get steel. In most situations we're framing with wood, particularly for structural support." The move in recent years is towards using wood more efficiently, he says. Many contractors are using engineered wood like I-joists, manufactured from renewable trees - that is, faster-growing species. Dean says I-joists use 50 percent less lumber than ordinary lumber. They are strong and lightweight and have reduced moisture content, which means fewer pops and squeaks. The kitchen may be the best room in the house, but it's also the most wasteful. According to the US Dept. of Energy, lighting, refrigeration and cooking are responsible for 41.5 percent of a home's energy consumption. To take the "heat out of the kitchen," you'll want to look for appliances that use energy-saving technologies. Consider installing an Energy Star refrigerator, dishwasher or vent fan. Because these appliances use 10 to 50 percent less energy and water than standard models, the money you save on your utility bills can more than make up for the cost of a slightly more expensive but more efficient Energy Star model. Manufacturers have stepped up with many great water-saving products for the bathroom, says Tracy Logan, showroom manager at Central Plumbing and Heating. From faucets to showerheads, look for the EPA's WaterSense label, meaning they are at least 20 percent more efficient than standard models. And today, a toilet is not just a toilet anymore. According to the EPA, the average American home uses more water for flushing the toilet than running the shower, so be sure to look for high-efficiency toilets. "Basically, it's a toilet that will flush less – using around 1.28 or 1.1 gallons, compared to the normal 1.6 gallons," says Logan. WaterSense partners include some of the biggest manufacturers in the business, including Kohler, Toto, Delta Faucet, American Standard and Moen. For a full list of labeled products, visit www.epa.gov/watersense. High efficiency furnaces or hot water heater combos have changed the way we heat our houses, says Dean of Grayling Construction. The efficiency ratings are off the scale compared to how inefficient the old models were. "In the 70s and 80s, the efficiencies of furnaces were 50-70 percent. Now we are at 90 percent," says Rob Merchant of Moore Heating. "In the old days, your furnaces and boilers came with a standard gas valve," he says. "Now, they come with a modulating gas valve. It only uses what it needs." Merchant also says to have your equipment installed by a dealer. This ensures that your system performs at optimal efficiency. Replacing your manual thermostat with a programmable model is another great way to shave off some energy, Merchant says. "Replacing the model can keep a temperature set and save you about a $100 a year." About one-third of a home's total heat loss usually occurs through windows and doors, so when shopping for windows and doors, look for the most energy-efficient models. For windows: "To be more energy efficient we reverse the low-"e" coating to the inside of the window," says Dean. "We want our heat reflected back into the house. In the lower 48, they want their heat reflected out." For doors: "Better lock systems and flanges for doors have improved their efficiency to make them seal much tighter and be more secure at the same time," says Dean. "Doors can be reused and refinished to meet a new color scheme," she says, "but usually the chemicals used for stripping are not environmentally friendly and the labor costs are so high that doors are rarely re-used." "We've headed a little in the wrong direction on lighting," Dean says. "We tend to use a lot of halogen bulbs. They are the tiny bulbs that give great, clean light but get hot and burn a lot of electricity." Xenon, LED or fluorescent lights are much better, she says. Fluorescent has improved to give great color with their color spectrum bulbs. "The electronic ballasts are much better than the old ones. They don't hum and they turn on quickly." Pat Tomlinson, of Brown's Electric, says most people think of fluorescent light bulbs when thinking green. "They do take the least amount of energy, but they are not all-rated in closed fixtures. They burn out really fast and they get too hot," says Tomlinson. "Only use them if they have air space and if they drop down from the ceiling." The trend right now is the small fixtures, she says. "Ten to 15 years ago, track lighting used huge 150-watt light bulbs." Now there are many different styles of lighting for many different purposes. Instead of using one kind of bulb, mix it up depending on its location, Tomlinson suggests. 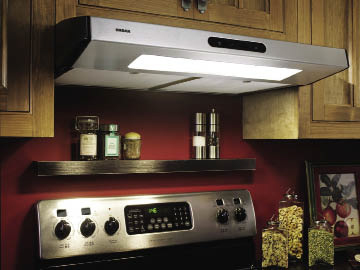 For example, xenon bulbs are good for cabinet lighting because they are low-voltage and won't get too hot. With tighter houses and more indoor air-quality concerns, insulations are also going greener these days. "The industry is forever striving to not be oil related," says Jeff Jensen, president of Alasco General Construction Insulation. He notes that insulation companies are moving towards bio-based foams that contain small amounts of vegetation like sugar because they are renewable. Jensen recommends Spider Custom Insulation by Johns Manville. It's a spray that resists mold because it sprays in almost dry, and is treated with a US EPA-registered mold inhibitor to protect the insulation against mold. Jensen likes the product because "it is manufactured on the job site, uses water-based glues and formaldehyde-free fiberglass." For people who are concerned about formaldehyde off-gassing into their homes – a major indoor air quality issue for green builders – this line of formaldehyde-free insulation passes the Environmental Specification 1350, the toughest indoor air quality test in North America. Thermo-Kool is another green insulation option, and it's made locally. The Anchorage company shreds recycled newspaper, then treats it with a non-flammable coating, turning it into cellulose insulation. When it comes to flooring, "there is something in every category that is green these days," says Jackie Gregory of Alaska Wholesale Flooring. If you want ceramic tile, hard wood from a managed forest or a floor that has a core of recycled materials, it is absolutely possible. Products manufactured from rapidly renewing forests, for example, can provide the homeowner with a beautiful, affordable and durable floor – and an environmentally responsible choice. Bamboo and cork flooring products are sustainable alternatives to slower growing hardwoods. Wayne Miller, sales manager at Florcraft, recommends Montado cork flooring. "Cork is renewable. It's harvested from oak trees about every nine years," he says. It's made from the bark of the oak only, so no trees are being cut down. "It's also very quiet, comfortable and warm for being a hard floor." 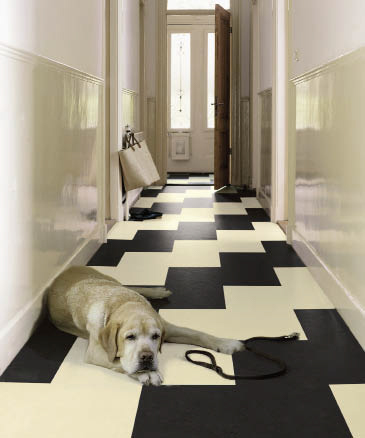 Other green flooring options include Marmoleum (linoleum produced from renewable materials) and Corian (containing recycled products), says Gregory. Carpets, too, can be a green choice. "Carpets contain recycled products and they are set up for recycling in their next life. Park benches, curbs and patio sets come from recycled carpet fiber materials." Countertops and backsplashes are going green too. Mark Sprano of Alaska Marble & Granite recommends engineered stone as a more earth-friendly alternative. The product uses quartz remnants that would normally be discarded. The finished product is non-porous and resistant to stains, cracks and heat. For backsplashes, showers and other areas, consider using recycled tile products made from glass or other materials. Many conventional paints and finishes contain high levels of volatile organic compounds (VOCs) that produce potentially harmful gasses when applied. Today, low- and no-VOC paints are available almost anywhere, and can help improve the indoor air quality of the home, making it particularly safer for people with chemical sensitivity. "If you don't have allergies, most of the paints are still low and will not generally bother you," says Derek Cohen of Curtis & Campbell. Zero-VOC paint is most commonly found in places like hospitals and schools. Cohen says they carry many low-VOC paints, such as PPG's Pure Performance, Benjamin Moore and DuVoe. Higher sheen levels and darker colors have more VOCs in the product. "The pigment has VOCs but not a substantial amount," says Cohen. Low VOC paint is available in different colors and finishes, but as of right now, they don't have any exterior paint. "You may see it in the future."